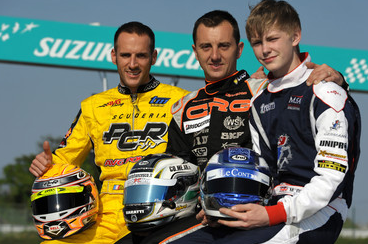 World KF1 Championship: Three World Champions in Suzuka | Vroomkart International Over two days, the 35 drivers competing in the World KF1 Championship have been preparing for the first round of the 2012 season. On the fast Suzuka circuit, each of them has been trying to find the best set-up before tackling the two days of racing.
" /> Over two days, the 35 drivers competing in the World KF1 Championship have been preparing for the first round of the 2012 season. On the fast Suzuka circuit, each of them has been trying to find the best set-up before tackling the two days of racing. Over two days, the 35 drivers competing in the World KF1 Championship have been preparing for the first round of the 2012 season. On the fast Suzuka circuit, each of them has been trying to find the best set-up before tackling the two days of racing. Between professional drivers and young pretenders, and also between Europeans and Asians, the battle is shaping up to be a tough one! In the pack are three drivers looking for another world title: Davide Foré, Arnaud Kozlinski and Matthew Graham. Venue for the first meeting of the CIK-FIA World KF1 Championship is Suzuka, a circuit steeped in history. Everyone remembers the close of the Formula 1 Grand Prix so critical in deciding the World Champion. A stone’s throw from the famous motor racing circuit, this year celebrating its fiftieth anniversary, the Suzuka kart track is welcoming the world of karting for a second time. But whilst the Japanese track was the scene for the crowning ceremony last year, this time it opens what promises to be a hard-fought 2012 season. Although Nyck De Vries has moved up to cars, there will still be three former World Champions on the grid: the Italian Davide Foré, who took four titles between 1998 and 2006, the Frenchman Arnaud Kozlinski, crowned in 2009, and the young British driver Matthew Graham, U18 World Champion (for under-18s) in 2011. Two other young drivers caused something of a stir in free practice: in fact Christian Sorensen (LH-BMB) from Denmark and Max Verstappen (Intrepid-TM) from the Netherlands were only a fraction of a second behind the Japanese driver. In brief, the suspense should be considerable from Saturday morning qualifying. Suzuka is also venue for the Asia-Pacific KF2 Championship, which will be fought at a single meeting. So the final, scheduled for Sunday afternoon, will be decisive. On Saturday the 30 drivers involved will be at the heart of the action in qualifying and the first rounds proper.